← What Caused the Rift? Topic February/March 2017. This Topic will look mainly at two men, their influence on the Legion and the Commonwealth (then the Empire) and the influence of the Legion on them. One of the names, Lieut. Stanley Fred Shingleton, (1889-1961) will almost certainly be unknown to most readers, but the name of Leo Amery will no doubt ring a bell and may indeed be well-known to some. It may come as a surprise to most that Rt. Hon. L.C.M.S. Amery, M.P. (1873-1955) was a Frontiersman in his own constituency in Birmingham and also served as the Hon. Commandant of the Edgbaston Squadron. Capt. Owen Lewis, local Councillor, and the agent for Amery, served as a Frontiersman in that Squadron. The rank and position of “Commandant” may seem unusual, but in fact Legion military-style ranks above Captain are only a fairly recent introduction. For much of its history the Legion stuck to the original principles (rigidly enforced by Driscoll) that no Frontiersman officer should carry any such rank higher than Captain unless he had achieved that substantive rank in the army, when he could then be referred to as “Major” or “Colonel”. Lieut.-Commandants wore Major’s insignia and Commandants that of Lt-Col.
Amery was an Imperialist who served as Colonial Secretary from 1924 to 1929. He could be called the “Father of the Commonwealth” because of his work at the 1926 Imperial Conference. This resulted in the Dominions being declared “Autonomous communities…equal in status..united by a common allegiance to the Crown.” Earlier in that decade Amery was keen on the principle of “overseas settlement” (rather than using the word “emigration”) and on the development of the wealth and population of the whole British Empire. He persuaded the Cabinet to authorise a free passage to the Dominions for any ex-serviceman or woman who wished to seek a new life. In that time of unemployment and hardship, which had hit the ex-serviceman very hard, many, including Frontiersmen, re-settled and sought prosperity in countries such as Kenya, Canada, Australia and New Zealand. By the time the scheme ended in 1924, around 86,000 people had taken advantage of it. The “Frontiersman” carried regular articles extolling the virtues of life in Canada as well as Australia and New Zealand. Amery was often ahead of his time and thought that the Colonial Secretary should visit all the Dominions making personal contact and seeing things for himself. Certainly he recorded visiting Frontiersmen units when in New Zealand in January 1928, where he was made most welcome by Wanganui and by Wellington Squadrons among others. Amery was also involved in 1928/9 when the Frontiersmen were used officially to assist the British authorities in Egypt, a subject we will cover in a later Topic page. An accomplished linguist in many languages and a highly skilled mountaineer, he was equally at home dealing with generals and politicians as he was talking to the Frontiersmen at their meetings about their experiences in the Great War and their problems returning to civilian life – after all he had served at the Front himself, also in Serbia and Salonika, and had been torpedoed at sea. Like a number of other men of power and influence, he was a keen supporter of the Legion. He was a very short man and, in spite of his ease in conversations with anyone, his speeches in Parliament could be very long. It was said of him that, had he been half a foot taller and his speeches half an hour shorter, he could have served in one of the highest Offices of State such as Home Secretary, Foreign Secretary or even Prime Minister. Leo Amery is remembered today mainly for one famous speech. He achieved his finest Parliamentary hour on 7th May 1940. Things were looking bad. The Germans had just conquered Norway and the Norwegian Army had been lost. Neville Chamberlain, the Prime Minister, had given a lack-lustre speech. When the Deputy Leader of the Labour Party rose to speak, Amery’s words rang round the Chamber “Speak for England!”. Amery was a great student of Oliver Cromwell and ended his own very powerful speech by quoting the words of Cromwell to the Long Parliament, but which he addressed to Chamberlain: “You have sat too long here for any good you have been doing. Depart, I say, and let us have done with you. In the name of God, go!”. Chamberlain resigned and so, thanks in part to the wonderful speech of a Frontiersman and keen supporter of the Legion, the great War Leader Winston Churchill became Prime Minister. The rest, as they say, is history. What about our second man, the forgotten Stanley Fred Shingleton? He had joined the Territorial Army in 1909 and in 1914, as an ex-Public School pupil (Haileybury), was considered by the opinion of the time to be an obvious candidate for a commission and was appointed to the Royal Field Artillery as Second Lieutenant. As a reliable but unspectacular officer he only received one promotion, to full Lieutenant. He was Mentioned in Despatches at the Somme but invalided home in 1917 with “neurasthenia”, which we would probably call some form of shell-shock. The treatment given to officers was better than the rank and file and by the end of 1917 he was fit enough to be posted to Egypt and Palestine with the R.H.A. within the Anzac Division of the Desert Mounted Corps. Early in the 1920s he had joined the Legion of Frontiersmen where he became an enthusiastic, although not especially active, Legion officer. Like Leo Amery, he had the gift of writing, although there is no record of him having any books published. He was known as an excellent descriptive writer for his contributions to The Frontiersman magazine. What caused Shingleton to join the Legion? The answer to this would apply to many others who joined between the Wars and steadily swelled the membership. This was a reason that Amery, having also suffered the horrors of front-line warfare, would have understood. He would have had great sympathy for these men. Men had come home from the War, often to find that their pre-war jobs were no longer open to them: that the economic situation was such that there were too many men chasing a few vacancies and that employers did not want men who were disabled even in a minor way by their wartime service. Who would want a man who still had malaria in his blood from service in the tropics and who could suddenly have to take days off due to an unexpected recurrence? Job security was non-existent and an employer could hire and fire at will. Those who had not been to war for any reason and had no “baggage” were far more in demand, increasing the bitterness of men who found that a row of medals, even gallantry awards, meant nothing to a prospective employer. Joining the Legion gave them a sense of purpose and a return to the comradeship and security of a uniformed organisation without the horrors of war. At Legion meetings they could share tales of their experiences, which acted as some therapy for their problems and nightmares. 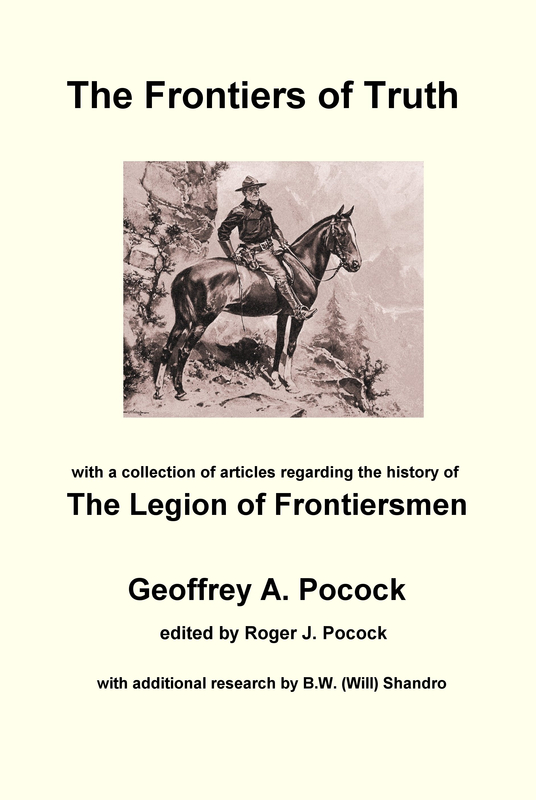 The Legion also did its best to see if jobs could be found for the Frontiersmen who needed them. The problem for the Legion was that many men found it difficult to spare the subscriptions and the Legion was permanently in debt. Thanks to the very wealthy Treasurer and, after 1925, “Acting” Cdt.-General Burchardt-Ashton, the Legion was several times saved from folding due to financial problems. In spite of this, Burchardt-Ashton was not really popular, as opposed to his predecessor, Col. Tamplin. Burchardt-Ashton had not fought in the War as he was too old, nor had he been in the Boer War, like Tamplin, as he was in Hawaii making his fortune. Few knew that Burchardt-Ashton’s son and heir had been killed in action in France. No wonder these men suffered dreadful nightmares for the rest of their lives! It was in the vicinity of Bullecourt during March 1917 when I was responsible for keeping the whole of the infantry of my Division supplied with ammunition, that a very curious situation arose in connection with which I was recommended to be “court-martialled” and “Mentioned in Dispatches” for the same act. Our infantry had made an attack for which I had supplied them with large quantities of grenades and rifle ammunition, and on demanding further supplies from Divisional headquarters to replenish my stock I was told, to my amazement, that there was no ammunition immediately available as owing to a blunder by a staff officer at the Base the ammunition train had not brought any supplies for our Division for two days. I sent a telegram to Corps H.Q. but still no ammunition was forthcoming, and as a heavy counter attack was expected, the situation was now becoming critical, so I turned out three wagons and rode off with them post-haste in search of ammunition. Coming across an ammunition dump beside a railway siding with a sergeant-major in charge, I at once gave him orders to fill my three wagons to their greatest capacity; he began to explain that the ammunition was not for our Corps. I however told him to obey my orders, which were urgent, and giving him a receipt for the goods taken, I rode off with my three wagons as fast as they could go and delivered one load to each Brigade just in the nick of time, as their supplies were running short and the Germans were counter-attacking in a very determined effort to drive us back. It was a near thing, and my wagons were greeted with a cheer on their arrival, for that supply of ammunition enabled the infantry to beat off the attack and continue to hold the line which must otherwise have given way. His action in “borrowing” the ammunition was something which the great Lt.-Col. Driscoll would have expected and approved of from any Frontiersman. Did these two men ever meet? It is doubtful, although quite possible. Amery’s later life was to involve the deepest sorrow. His second son, Jack, who nowadays would have been diagnosed with mental illness and treated for it, travelled to Germany and was tried at the end of the war for treason and executed. He attempted, completely unsuccessfully, to recruit disaffected British prisoners-of-war to fight with the Germans against the Russians. His proposed name for this unit? The Legion of St. George! No doubt he had heard his father speak about the Legion of Frontiersmen. Also Jack Amery had been friends with the unreliable “Count” Johnston-Noad, who for a time in the 1930s commanded the Legion Maritime Command.² We know little of Shingleton’s later life. He is recorded as living in a succession of rooms in what appear to be boarding houses in west London until he died in 1961. As far as we know he never married. His engagement to a Miss Dorothy Knox was announced in “The Frontiersman” in May 1926, but this seems to have come to nothing. In 1938 a Miss Davidson of Edinburgh wrote to the War Office seeking information about him as they had apparently been friendly until his letters to her ceased during the First War. He had told her that he expected to be somewhat deaf for the rest of his life; a regular problem for men working in close proximity to the big guns. As a final point, the photo above shows a disabled soldier from the First War still selling wooden crosses and collecting for his old comrades in 1938 at the Field of Remembrance in London. Frontiersmen always attend that November ceremony (as do members of the Royal family) every year and will annually continue to pay their respects there for those Frontiersmen who lost their lives fighting in two wars. It is worth noting that there was no free National Health Service in Britain between the wars, so this old soldier could not get a prosthetic leg in spite of his sacrifice. He had to make do with a pair of wooden crutches. ¹ Taken from The Frontiersman, November 1926, p.76. Another article Shingleton wrote for the magazine was of his experiences as a F.O.O. (Forward Observation Officer). This position directing the guns was of the greatest danger and one needing great skill and courage. ² An excellent biography of Leo Amery and his sons is David Faber’s “Speaking for England” (The Free Press, 2005) No mention of the Legion of course, but there seldom is in such books. Even when the Legion is mentioned in passing, it is usually inaccurate. © Copyright Geoffrey A. Pocock. All rights reserved. This article may not be reproduced in any form, in part or in full, without prior permission. This entry was posted in Frontiersmen, History, Legion of Frontiersmen and tagged Leo Amery, Remembrance, Shingleton. Bookmark the permalink.